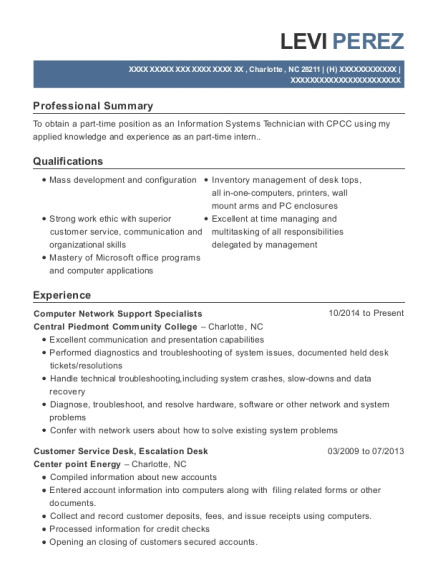 Accomplished and energetic Systems Administrator with a solid history of achievement in network support. Motivated leader with strong organizational and prioritization abilities. Novell Netware, Windows (Vista, XP, NT, 2000), Lotus Notes, FoxPro, Linux, UNIX, GroupWise, Remedy, Altiris, Vertex, Citrix , Token Ring, Ethernet, VSX, Project Server, Windows 2000/2003/2008 Server, Active Directory, DHCP, PPTP, IPX, TCPIP, MOM, SMS, ColdFusion, Bluecoat Proxy, WAF(Web App firewalls) Remote Access Tools (Fire Pass- SSL-VPN) (Event Logging- Access Server Errors) Encrypt Data, and Authenticate User .Edge Gateway. Remedy ticketing processing. Deployed approved company software via Altiris, OS, applications and drivers. Supported over 180 world wide applications remotely and locally. Configure and define parameters for installation or testing of local area network (LAN), wide area network (WAN), routers, controllers, multiplexers, or related networking equipment. Worked with vendor support contacts to resolve technical problems with desktop computing equipment and software. Interact with numerous computer platforms in a multi-layered client server environment to ensure desktop computers interconnect seamlessly with diverse systems, including associated validation systems, file and email servers, computer conferencing systems, application servers, and administrative systems. Remote Access Network Monitoring traffic between the dial-up networking client and the remote access server. Maintain the Remedy Ticketing Database. Use Remedy database, staff scheduling, meeting service level agreements (SLA's) and managing projects. Check Point VSX-1 Implement Security Appliances enable organizations to consolidate infrastructure in high-performance environments, such as large campuses or data centers Virtual Private Network (VPN), URL filtering and intrusion prevention technology (IPS). Met service level agreement (SLA) measurements for contacting the client, maintenance, and installs. Flexible deployment-open platforms and full line of turnkey appliances Testing and troubleshooting, firewall rules for the 7 layers of checkpoint. Virtualizing physical network components into one physical device. Generated end of day audit reports to reflect ticket activity from open through the close. Supervised network support and client server specialists. Planned, coordinated, and implemented network security measures. Installed, configured, and supported LAN, WAN, and Internet. Maintained network hardware and software. Monitored networks to ensure availability for system users. Performed necessary maintenance to support network availability. Provided support and administration for the client services enterprise infrastructure including patch management and virus management. Supported applications and hardware for telecommuters and local users utilizing company methodology and local tools and inventoried and cataloged all pieces of equipment and parts. Conducted hardware and VPN training for telecommuters. Prepared work cubes for new employees and handled company moves from switch to cube ports while ensuring the PC deployment process and production environment complied with company standards. Enron Broadband Services, Managed a variety of host servers. Managed day to day operations, including server monitoring, backup, verification of scheduled events and capacity planning. Process users with Remedy ticketing. Developed and supported SQL Servers. Configured and upgraded Compaq firmware and drivers. Installed and configured applications and network printers. Migrated user data to temporary servers. Installed and configured Windows 95 for users with software not supported by Windows NT. Installed Windows NT and patches. Created and upgraded Compaq system partitions. 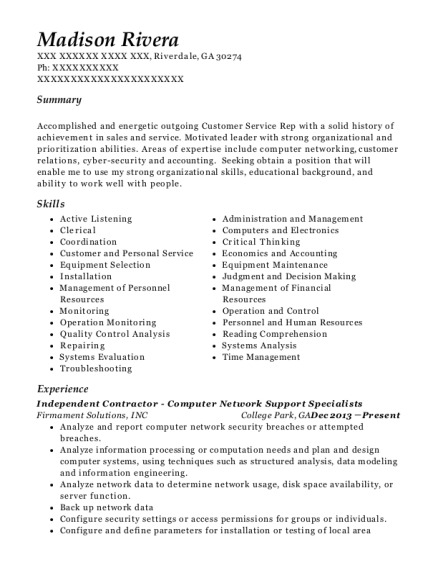 This is a resume for a Network Support Specialist in CANA, Virginia with experience working for such companies as Smart Source Inc and Apex. 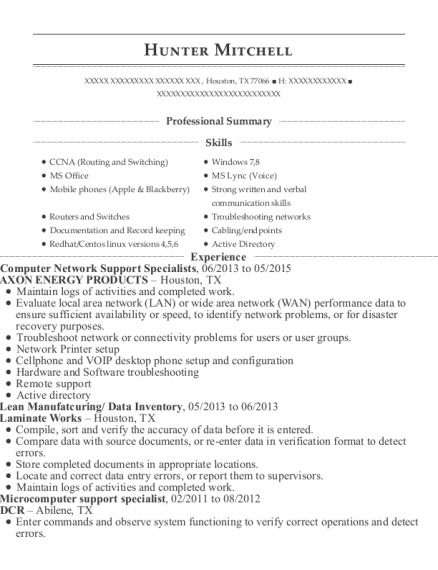 The grade for this resume is 0 and is one of hundreds of Network Support Specialist resumes available on our site for free. 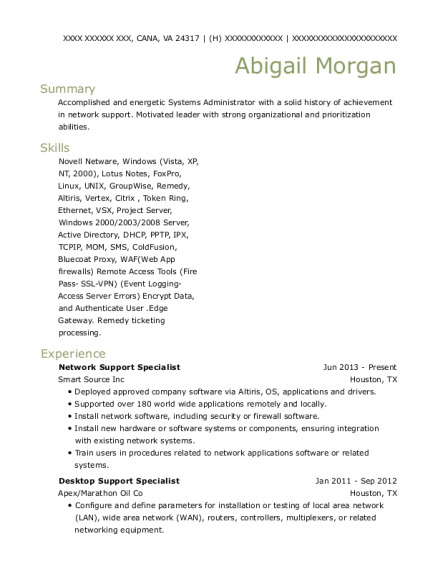 Use these resumes as templates to get help creating the best Network Support Specialist resume.